Stepping Stones Child Care and Learning Program provides care and an educational environment for children ages 2 (by August 1) to 4 years old. Stepping Stones is similiar to a Mom's Morning Out program, but in a small group home setting rather than a church or preschool facility. We meet during the school year on Tuesday/Thurday or Wednesday/Friday from 9:00 A.M. to 12:00 P.M. Depending on availability, you may choose which day(s) works best for you. ** Beginning in the Fall 2018 - I will be offering a one, two, three, and four day session (Tuesday, Wednesday, Thursday, and Friday). Sessions are based on availability at the time of enrollment. During our time together I will provide your child with a loving environment for learning and play. 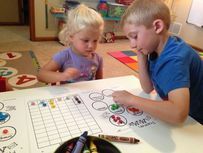 CIRCLE TIME - Letter of the Week, Colors, Shapes & Numbers, Games, Songs, Calendar & Weather. STORY TIME - to develop an appreciation and enjoyment of literature. Reading activities help enhance children's vocabulary and comprehension skills. TABLE ACTIVITIES - Art & crafts, tracing practice, worksheets, cutting practice, puzzles, play-doh, kinetic sand, ect. LARGE MOTOR SKILLS - Outdoor play (weather permitting). NUTRITIONAL SNACK - will be provided daily. SONGS/MUSIC - Children will listen and sing songs while also using a variety of musical instruments. ​EDUCATIONAL DVD -We will wrap up our time together with 10 minutes of an educational DVD/songs while we pack up and wait for moms and dads to pick up. At Stepping Stones I will be teaching your child educational and social skills that will better prepare them for their next steps in learning. 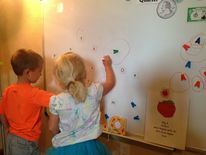 The small group setting of 5-9 children will allow me to provide your child with a lot of one on one attention, while also allowing them to develop deeper connections and new friendships with their peers.